This week I’m heading to Lincoln, Nebraska for Digital Humanities 2013 (abstracts) (where I’m also doing a half-day workshop on ‘Designing successful digital humanities crowdsourcing projects‘ and attending my first meeting as a member of the ACH Executive Council). After DH2013, I’m gradually making my way east by Amtrak and Greyhound, ending up at One Week, One Tool (‘a digital humanities barn raising’!). I’ll be in Chicago from Sunday afternoon (July 21) until late 22nd, arriving in Cleveland on the 23rd and jumping on another bus to Pittsburgh for July 24-27. If you’re going to be nearby and fancy a chat about crowdsourcing, museums or digital history, or have a suggestion for sights I should see, let me know! You can get a sense of my interests at the never-properly updated Upcoming talks and travel and My PhD research. Some people who couldn’t make the Museums Association conference (or #museums2012) asked for more information on the session on digital strategies, so here are my introductory remarks and some scribbled highlights of the speakers’ papers and discussion with the audience. Update: a year later, I’ve thought of a ‘too long, didn’t read’ version: digital strategies are like puberty. Everyone has to go through it, but life’s better on the other side when you’ve figured things out. Digital should be incorporated into engagement, collections, venue etc strategies – it’s not a thing on its own. After various conversations about digital and museums with people who were interested in the session, I updated my introduction so that overall the challenge of embracing the impact of digital technologies, platforms and audiences on museums was put in a positive light. The edited title that appeared in the programme had a different emphasis (‘Go digital’ rather than the ‘Getting strategic about digital’ we submitted) so I wanted it to be clear that we weren’t pushing a digital agenda for the sake of technology itself. Or as I apparently said at the time, “it’s not about making everything digital, it’s about dealing with the fact that digital is everywhere”. I started by asking people to raise their hands if their museum had a digital strategy, and I’d say well over half the room responded, which surprised me. Perhaps a third were in the process of planning for a digital strategy and just a few were yet to start at all. My notes were something like this: “we probably all know by now that digital technologies bring wonderful opportunities for museums and their audiences, but you might also be worried about the impact of technology on audiences and your museum. ‘Digital’ varies in organisations – it might encompass social media, collections, mobile, marketing, in-gallery interactives, broadcast and content production. It touches every public-facing output of the museum as well as back-office functions and infrastructure. You can’t avoid the impact of digital on your organisation, so it’s about how you deal with it, how you integrate it into the fabric of your museum. As you’ll hear in the case studies, implementing digital strategy itself changes the organisation, so from the moment you start talking to people about devising a digital strategy, you’ll be making progress. For some of our presenters, their digital strategy ultimately took the form of a digital vision document – the strategy itself is embedded in the process and in the resulting framework for working across the organisation. A digital strategy framework allows you to explore options in conversation with the whole organisation, it’s not about making everything digital. Our case studies come from three very different organisations working with different collections in different contexts. Mike, Commercial Director at York Museums Trust will talk about planning the journey, moving from ad hoc work to making digital integral to how the organisation works; Hugh, Head of Digital Media at National Museums Scotland will discuss the process they went through to develop digital strategy, what’s worked and what hasn’t’; Carolyn Royston, Head of Digital Media at Imperial War Museums, who comes from a learning background, will talk from IWM’s digital adventure, from where they started to where they are now. They’re each at different stages of the process of implementing and living with a digital strategy. Mike talked about working out when digital delivery really makes sense, whether for inaccessible objects (like a rock on Mars) or a delicate book; the major role that outreach and communication play in the process of creating a digital strategy; appointing the staff that would deliver it based on eagerness, enthusiasm and teamwork rather than pure tech skills; where digital teams should sit in the organisation; and about the possibility of using digital volunteers (or ‘armchair experts’) to get content online. Hugh went for ‘frameworks, not fireworks’, pointing out that what happens after the strategy is written is important so you need to create a flexible framework to manage the inevitable change. He discussed the importance of asking the right-sized question (as in one case, where ‘we didn’t know at the start that an app would be the answer’) and working on getting digital into ‘business as usual’ rather than an add-on team with specialist skills. Or as one tweeter summarised, ‘work across depts, don’t get hung up on the latest tech, define users realistically and keep it simple’. Carolyn covered the different forms of digital engagement and social media the IWM have been trying and the role of creating their digital vision in helping overcome their fears; the benefits of partnerships with other organisations for piggybacking on their technology, networks and audiences, and the fact that their collections sales have gone up as a result of opening up their collections. In the questions, someone described intellectual property restrictions to try to monetise collections as ‘fool’s gold’ – great term! I think we should have a whole conference session on this sometime soon. When reviewing our discussions beforehand I’d found a note from a planning call which summed up how much the process should change the organisation: ‘if you’re not embarrassed by your digital strategy six months after sign-off you probably haven’t done it right’, and on the day the speakers reinforced my impression that ultimately, devising and implementing a digital strategy is (probably) a necessary process to go through but it’s not a goal in its own right. The IWM and NMS examples show that the internal education and conversations can both create a bigger appetite for digital engagement and change organisational expectations around digital to the point where it has to be more widely integrated. The best place for a digital strategy is within a public engagement strategy that integrates the use of digital platforms and working methods into the overall public-facing work of the museum. Listening to the speakers, a new metaphor occurred to me: is implementing a digital strategy like gardening? It needs constant care and feeding after the big job of sowing seeds is over. And much like gardening for pleasure (in the UK, anyway), the process may have more impact than the product. And something I didn’t articulate at the time – if the whole museum is going to be doing some digital work, we technologists are going to have to be patient and generous in sharing our knowledge and helping everyone learn how to make sensible decisions about digital content and experiences. If we don’t, we risk being a bottleneck or forcing people to proceed based on guesswork and neither are good for museums or their audiences. Huge thanks for Carolyn, Hugh and Michael for making the whole thing such a pleasure and to the Museum Association conference organisers for the opportunity to share our thoughts and experiences. And finally, if you’re interested in digital strategies in heritage organisations, the Museums Computer Groups annual Museums on the Web conference is all about being ‘strategically digital’ (which as you might have guessed from the above, sometimes might mean not using technology at all) but UKMW12 tickets are selling out fast, so don’t delay. Kevin Slavin’s (@slavin_fpo) thought-provoking keynote took us to Walter Benjamin by way of the Lascaux Caves and onto questions like: what does it do to us [as writers of wall captions and object labels] when objects provide information?. He observed, ‘visitors turn to the caption as if the work of art is a question to be answered’ – are we reducing the work to information? We should be evoking, rather than educating; amplifying rather than answering the question; producing a memory instead of preserving one; making the moment in which you’re actually present more precious… Ultimately, the authenticity of his experience [with the artwork in the caves] was in learning how to see it [in the context, the light in which it was created]. Kevin concluded that technology is not about giving additional things to look at, but additional ways to see. I’ve posted about the panel discussing ‘What’s the point of a museum website?‘ I was in after the keynote at Report from ‘What’s the point of a museum website’… and Brochureware, aggregators and the messy middle: what’s the point of a museum website?. I also popped into the session ‘Valuing Online-only Visitors: Let’s Get Serious‘ which was grappling with many of the issues raised by Culture 24’s action research project, How to evaluate success online?. This all seems to point to a growing momentum for finding new measurable models for value and engagement, possibly including online to on-site conversion, impact, even epiphanies. Interestingly, crowdsourcing is one place where it’s relatively easy to place a monetary value on online action – @alastairdunning popped up to say: ‘http://www.oucs.ox.ac.uk/ww1lit/ project – ‘Normal’ digitisation = £40 per item. Crowdsourced = £3.50 per item’, adding ‘But obviously cultural value of a Wilfred Owen mss is more than your neighbour’s WW1 letters and diaries’. One of the sessions I was most looking forward to was Online cataloguing tools and strategies, as it covered crowdsourcing, digital scholarly practices and online collections – some of my favourite things! Digital Mellini turned 17th C Italian manuscript (an inventory of paintings written in rhyming verse) into an online publication and a collaboration tool for scholars. The project asked ‘What will digital art history look like?’. The old way of doing art history was about solo exploration, verbal idea-sharing, physical book publications, unlinked data, image rights issues; but the promise of digital scholarship is: linked data opens new routes to analysis, scholars collaborate online, conversations are captured, digital-only publications count for tenure, no copyright restrictions… I was impressed by their team-based, born-digital approach, even if it’s not their norm: ‘the process was very non-Getty, it was iterative and agile’. They had a solid set of requirements included annotations and conversations at the word or letter level of the text, with references to related artworks. They’re now tackling ‘rules of engagement’ for scholars – where to comment, etc – and working out what an online publication looks like and how it affects scholarly practices. Yale Center for British Art (YCBA) Online Collections‘s goal was search across all YCBA collections. All the work they’ve done is open source – Solr, Lucene – cool! They’re also using LIDO (superceding CDWA and MuseumDat) and looking to linked data including vocabulary harmonisation. As with many cross-catalogue projects, they ended up using a lowest common denominator between collections and had to compromise on shared fields in search. I’m not sure who used the lovely phrase ‘dedication to public domain’… Both art history presentations mentioned linked data – we’ve come far! The final paper was Crowdsourcing transcription: who, why, what and how, with Perian Sully from Balbao Park talking with Ben Brumfield about how they’ve used his ‘From the Page’ transcription software. Transcription is not only useful because you can’t do OCR on cursive writing, but it’s also a form of engagement and outreach (as I’ve found with other cultural heritage crowdsourcing). They covered some similar initiatives like Family Search Indexing, whose goal is to get 175,000 new user volunteering to transcribe records (they’ve already transcribed close to a billion records) and the Historic Journals project whose goal is to link transcriptions with records in genealogy databases (and lots more examples but these were most relevant to my PhD research). Reasons for crowd participation (from an ornithology project survey) included the importance of the programme, filling free time, love of nature, civic duty and school requirement. People participate for a sense of purpose, love of the subject, immersion in the text (deep reading). The question of fun leads into peril of gamification – if you split text line by line to make a microtask-style game, you lose the interesting context. They gave some tips on how to start a crowdsourced transcription project based on your material and the uses for your transcription. The design will also affect interpretive decisions made when transcribing – do you try to replicate the line structure on the page? – and can provide incentives like competition to transcribe more materials, though as Perian pointed out, accuracy can be affected by motivation. I had to leave Philosophical Leadership Needed for the Future: Digital Humanities Scholars in Museums early but it all made a lot more sense to me when I realised Neal wasn’t using ‘digital humanities’ in the sense it’s used academically (the application of computational techniques to humanities research questions) – as I see it, he’s talking about something much closer to ‘digital heritage’. I still haven’t sorted out my notes from History Museums are not Art Museums: Discuss! but it was one of my favourite sessions and a great chance to discuss one of my museumy interests with really smart people. I was invited to take part in the Great Debate held as the closing plenary session. I was on the affirmative side with Bruce Wyman, debating ‘there are too many museums’ against Rob Stein and Roseanna Flouty. For now, I think I’ll just say that I think it’s the hardest bit of public speaking I’ve ever done – the trickiness of the question was the least of it! I think there’s a tension between the requirements of the formal debating structure and the desire to dissect the question so you can touch on issues relevant to the audience, so it’ll be interesting to see how the format might change in future. Finally, a silly tweet from me: ‘#mcn2011 I’ve decided the perfect visitor-friendly museum is the Mona Lisa on spaceship held by a dinosaur. 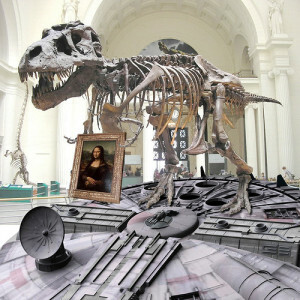 That you can buy on a t-shirt.’ lead to the best thing ever from @timsven: ‘@mia_out- this pic is for you- museum of the future: trex w/ mona lisa riding millenium falcon #MCN2011 http://t.co/37GdAD1O’. A really belated report from the ‘What’s the point of a museum website?‘ panel I was part of with Koven Smith (@5easypieces), Eric Johnson (@ericdmj), Nate Solas (@homebrewer) and Suse Cairns (@shineslike) at last November’s Museum Computer Network (MCN2011) conference. I’ve written up some of my own thoughts at Brochureware, aggregators and the messy middle: what’s the point of a museum website? – this post is about the discussion during the panel itself. There was a lot of audience participation (in the room and on twitter), which made tackling a summary of the discussion really daunting, so I’ve given up on trying to capture every thread of conversation and am just reporting from the notes I took at the time. It’s all bit of a blur now so it’s hard to remember exactly how the conversations went, but from my notes at the time, it included: Clay Shirky on social objects as a platform for conversation; games and other online experiences as big draws for museum sites (trusted content is a boon for parents); the impact of social media making the conversations people have always had about exhibitions and objects visible to curators and others; and the charisma of the physical object. From the audience Robin White Owen mentioned the potential for mobile apps to create space, opportunity for absorption and intimate experiences with museum content, leading me to wonder if you can have a Stendhal moment online? Is discoverability is the new authority for museum websites? As Nate said, authority online lies in being active online, though we also need to differentiate between authority about objects and narratives, and cite our sources for statements about online collections. (See also Rob Stein on the difference between being authoritarian and authoritative). But maybe that’s challenging too – perhaps museums aren’t good at saying there is no right answer because we like to be the one with the right answer. Someone mentioned ‘communities of passion’ gathered around specific objects, which is a lovely phrase and I’m sorry I can’t remember who said it. Someone else from the audience wisely said, it’s ‘not how do I drive people to my collection, but how do I drive my collection to them’. Andrew Lewis talked about ‘that inspiration moment’ triggered in a museum that sends you hurrying back home to make art or craft something. I talked about my dream of building a site that people would lose themselves in for hours, just as you can do on Wikipedia now after starting with one small query. How can we build a collections online site where people can follow one interesting-looking object or story after another? We can’t do that without a critical mass of content, and I suspect this can only be created by bringing different museum collections together digitally (or as Koven called it, digital repatriation), which also gets around the random accidents of collecting history that mean related objects are isolated in museums and galleries around the world. Also, we’re only ever part of the audience’s session online – we might be the start, or the end, but we’re more likely to be somewhere in the middle. We should be good team players and use our expert knowledge to help people find the best information they can. As with many conversations about online visitors, the gap between what we know and what we should know is frustratingly large, and we still don’t know how large the gap between what (particularly) collections online are and what they could be. Someone said that we’re (measuring, or talking about) what users currently do with what we give them, not what they really want to do. Bruce Wyman tweeted, ‘current visitors most frequently give *incremental* ideas. You need different folk to take those great leaps forward. That’s us’. Rob Stein said he didn’t care about measuring time online, but wanted to be able to measure epiphanies – an excellently provocative statement that generated lots of discussion, including comments that epiphany needs agency, discourse, and serendipity. Eric said we murder epiphany by providing too much information, but others pointed out that epiphanies are closely tied to learning, so maybe it’s a matter of the right information at the right time for the right person and a good dose of luck. So (IMO) it was a great panel session, but did we come up with an answer for ‘what’s the point of a museum website’? Probably not, but it’s clearly a discussion worth having, and I dare say there were a few personal epiphanies during the session. I’m collecting other posts about the session and will update this as I find them (or let me know of them in the comments): Suse’s Initial takeaways from MCN2011. I also collated some of the tweets that used the session hashtag ‘wpmw‘ in a document available (for now) via my dropbox. Finally, thank you to everyone who attended or followed via twitter, and particular thanks to my fellow panelists for a great discussion. Back in November I attended the Museum Computer Network (MCN2011) conference for the first time. I was lucky enough to get a scholarship (for which many, many thanks). During the conference I was part of a panel discussing ‘What’s the point of a museum website?‘ with (from l-r in the photo) Koven Smith (@5easypieces), Eric Johnson (@ericdmj), Nate Solas (@homebrewer) and Suse Cairns (@shineslike). I’ve posted about some of the ideas covered in the WPMW session, but this post is my attempt to think through ‘what is the point of a museum website?’ in the context of our MCN session. I’m not lying when I say ‘attempt’ – this post is a draft, but since it’s been a draft for months now, I’m going to take a deep breath and post it. I’d love to hear your thoughts, challenges, props, whatever, and I’ll update the post in response. 1. The practicalities. Unashamed brochureware may be enough for some museums (and may be all other museums, such as local authority museums tied to larger infrastructure, can manage): the practical, get-people-through-the-door stuff: why visit, how to get there, when to visit, what’s on. Facebook and Google are competing to host content like this, so presumably visits to these sites are generally going to decrease over time. This category reflects economic and organisational restrictions more than user requirements. 2. Collections online. An important, opinionated caveat: unless your ‘collections online’ interface is a destination in its own right, or adds unique value, I think the point lies in aggregated collections. Repositories like Europeana (and national aggregators like CultureGrid and Gallica), Collections Australia Network, Digital NZ, and the future Digital Public Library of America bring heavy-weight resources, SEO and discoverability and sheer scale to the ‘collections online’ work of a museum website. But this scale brings new problems – these big, chaotic pots of content can be difficult to use. Their sheer size makes it hard to highlight interesting objects or content. Meaningful search results are difficult*, even for the patient, expert researcher, because they tend to contain so many different kinds of content about a range of subjects, taken from a variety of source museums, libraries, archives with hugely variable metadata quality and schema. Better search engines, faceted browsing, etc, may help, but aggregators aren’t really designed for humans**. See also: 3a, ‘The carefully curated and designed experience based on a particular concept’ for a different view on collections online. 3. The messy middle. This includes all kinds of things that general audiences don’t seem to expect on a museum website – exhibition and marketing microsites, educational and family activities, public engagement experiences, games, lists of objects on display, research activities, etc. It’s a pretty safe guess that some of this content is online because it reflects the internal structure or requirements of the museum, is re-purposed from exhibitions, or is designed for specialist users (who may, however, also under-use it unless the collection is notably comprehensive or is one of the top hits for a Google search). For museums, the point of a museum website may be editorial voice, control, metrics, or an attempt to monetise their images. We know that lots of the messy middle really works for our audiences – for example, good games and other activities have metrics through the roof. But without more research it’s hard to know whether the content that audiences should love is less used than it might be because it’s not easily discoverable by non-visitors to the website, isn’t well advertised or consistently available on museum sites, or is competing with other groups that meet the same needs. Does the trust people place in museums translate into trusted online content – how much do audiences really know or care whether an online experience, mobile app or the answer to their kid’s homework question was provided by a museum? Do they value ‘authority’ as much as we do? When does museum content go from being ‘on your website’ to ‘being on the web’, and does it still matter? 3a. The carefully curated and designed experience based on a particular concept. From the Google Art Project to Europeana’s Weddings In Eastern Europe, sites that draw on digital objects and expert knowledge to create audience-focused experiences could be the missing link between the in-gallery exhibitions museums love and the audience-focused born-digital experiences that are appropriately rich and/or snackable, and could be the source of the next great leap forward in museums on the web. Museums can take the lessons learnt from years of topic-specific cross-institutional projects and research on existing audiences, and explore new models for audience engagement with museums online. And perhaps more importantly, work out how to fit that into places our audiences already hang out online and let them share it promiscuously. So, what’s the point of a museum website? At the simplest level, the point of a museum website is to get visitors into venues, and maybe to sell them tickets or products. Ideally, the point of aggregators is to surface content hidden in the deep web so it’s discoverable on your Google search results page and can be put into context with other resources. The very messiness of messy middle category makes it harder to answer the question – it’s the fun stuff, but most of it is also hardest to measure or to justify in terms of return on investment. This is where asking more specific questions becomes more useful: not just, ‘what’s the point?’ but ‘the point for whom?’. In the cold light of the budget cuts, perhaps it’s better to ask ‘how do you prioritise your museums’ web work?’. Both the ‘practicalities’ and the aggregators are broadly about access – getting people into the galleries or to catalogue records so they can discover and make the most of your collections. The messy middle bit is broadly about engagement, which I suspect is key to broadening access by providing better ways for more people to access our collections. As a museum technologist it hurts to say this, but if your museum isn’t genuinely interested in online engagement or just can’t resource it, then maybe the point of your website is to meet the practicalities as well as you can and push your content up into an aggregator. I think we’re still working to understand the role of online content in the relationship between museums and their audiences, but despite my final note of doom and gloom, I hope museums keep working at it. As Bruce Wyman tweeted at the MCN session, “current visitors most frequently give *incremental* ideas. You need different folk to take those great leaps forward. That’s us”. Do we lose more than we gain by separating ‘museum as venue’ from ‘museum as holder of collections’ and ‘museum as space for engaging with culture, science and history’? And is it acceptable for some museums to stick to brochureware if they can’t manage more? What do you think? * The aggregation model also potentially applies to museum shops and picture libraries (ArtFinder, Culture Label, etc) but, perhaps because commercial profits are riding on the quality of the user experience, they tend to have more carefully tended information architecture and they’re closer to the ‘curated experience’. ** I’ve also written about audience issues with aggregation (boo) and the potential for ‘Museum data and the network effect’ (yay!) in ‘Museums meet the 21st century’, The rise of the non-museum (and death by aggregation), Rockets, Lockets and Sprockets – towards audience models about collections? and (back in 2009) Happy developers + happy museums = happy punters. One reason aggregated collections aren’t a great user experience is that paucity of museum collection data, though that can be improved with crowdsourcing, which as a bonus appears to be a great way to engage audiences. Posted on 12th February 2012 5th February 2015 Categories Museums, Museums, libraries and archives, UncategorisedTags audiences, conferences, MCN2011, museums, WPMW8 Comments on Brochureware, aggregators and the messy middle: what’s the point of a museum website? Some very scrappy notes from the EuropeanaTech conference held in Vienna this week as I prepare a short talk for the Open data in cultural heritage (LODLAM-London) event tonight… For a different perspective there’s an overview post at EuropeanaTech – är det här framtidens kulturarv? and I’ll link to any others I find. I’ve also put up some photos of ten questions attendees asked about Europeana, with written answers from the break-out exercise. I’ll tidy up and post my keynote notes in a few days, and I’ll probably summarise things a bit more then. Max Kaiser: Europeana is like a cruise ship with limited room to move, hackathons inject Europeana with a bit more agility… Build real stuff for real people with real business requirements – different to building prototypes and proofs of concept – requires different project culture. Bill Thompson: pulling the analogue past into the digital future… We don’t live in a digital world and never will – the physical world is not going to vanish. We’ll remain embodied minds; will have co-existing analogue and digital worlds.Digital technologies shaping the possibilities we decide to embrace. … Can’t have a paradigm shift in humanities because no basic set of beliefs to argue with… But maybe the shift to digital is so fundamental that it could be called a paradigm shift. … Even if you don’t engage online, you’ll still live in a world shaped by the digital. Those who are online will come to define the norms. … Revolutionary vanguard in our midst – hope lies with the programmers, the coders – the only weapon that matters is running code. Have to build on technologies that are open, only way to build diverse online culture that allows all voices to be heard. … Means open data in a usable form – properly formulated so can be interpreted by anyone or any program that wants it; integrate them into the broader cultural space. Otherwise just disconnected islands. Two good reasons to endorse open linked data. We’re the first generation that’s capable of doing this – have the tools, network, storage, processes. Within our power to digitise everything and make it findable. We may also be the only generation that wants to do it – later generations will not value things that aren’t visible on the screen in the same way – they’ll forget the importance of the non-digital. So we’d better get on with it, and do it properly. LOD is a foundation that allows us to build in the future. Qu: how does open theme fit with orgs with budget cuts and need to make more money? BT: when need to make money from assets, openness is a real challenge. There are ways of making assets available to people that are unlikely to have commercial impact but could raise awareness e.g. low-res for public access, high-res for commercial use [a model adopted by many UK museums]. Jill Cousins: there’s a reputational need to put decent resolution images online to counter poor quality versions online. Max: be clever – don’t make an exclusive contract with digitisation partners – make sure you can also give free access to it. Jill Cousins: User always been central to Europeana though got slightly lost along the way as busy getting data. … Big stumbling block – licenses. Not just commercial reasons, also about reputational risk, loss of future earnings, fear of giving away something that’s valuable in future. Without CC licence, can’t publish as linked open data. Without it, commercial providers like INA can’t take the API. Can’t use blogs that have advertising on them. Couldn’t put it on Wikipedia. Or ArtFinder. … New [UK?] Renaissance report – metadata related to the digitised objects by cultural heritage orgs should be widely and freely available for re-use. Workshops with content holders: Risks – loss of quality, loss of control, attribution, brand value, potential income (‘phantom income’), unwanted spillover effects – misuse/juxtaposition of data. Rwards: increasing relevance, increasing channels to end users, data enrichment, brand value, specific funding opportunties, discoverability, new customers, public mission, building expertise, desired spillover effects. … You are reliant on user doing the right thing with attribution…. Main risks: unwanted spillover effects, loss of attribution, loss of potential income. Main rewards: new customers, increasing relevance, public mission. But the risks diminshed as the rewards gain more prominence – overall outweighed the risks. But address those 3 areas of risk. What next? Operationalise some of the applications developed. Yellow Kitchen Maid paper on the business of open data. Working together on difficulties faced by institutions and licensing open data. You had to pick a question and go into a group to try and answer it – I’ve uploaded photos of the answer sheets. 1 Open source – if Europeana using open source software and is open software, should it also become a community-driven development project? 2 Open source – are doubts about whether OSS provides quality services justified? What should be done to ensure quality? 3 Aggregation and metadata quality – what will be the role of aggregators, and what is role of Europeana in LOD future? 4 What can Europeana do which search engines can’t that justifies the extra effort of creating and managing structured metadata? 5 Is EDM [Europeana Data Model] still too complicated? If yes, what to simplify. 6 What is the actual value of semantic contexualisation, and could that not be produced by search engines? 8 How important is multilingual access for discovery in Europeana? Which elements are the most important? 9 Can Europeana drive end-user engagement on the distributed sites and services of contributing archives? 10 How can we benefit from existing (local, international) communities in enriching the user experience on Europeana?